Our deal hunting team had found something amazing again: super cheap flight to Georgetown, Guyana with Copa Air for $301 r/t, including taxes. 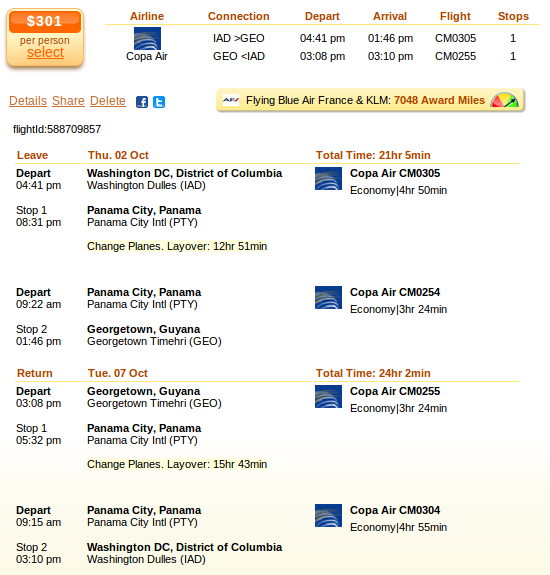 This flight is exactly $225 cheaper that the next best airfare deal we could find for this route, so do not let it go! The flight deal is provided by Expedia, but we have found it on Travelgrove, so that is where you should look. To make sure there is no better offer out there than the one you are booking, check the prices of more merchants and compare them via the box. The Copa Air airfare that we have found departs from Washington Dulles International Airport (IATA code: WAS) on October 2. The flight takes 21 hours because it has got a nearly 13 hours stop in Panama City. The flight returns from Cheddi Jagan International Airport (GEO) on October 7. It arrives back to DC after 24 hours as it has an almost 16 hours stop in Panama City again. Layover times may seem long, but the saving is also huge! Plus you get 7,048 award miles, about 13% percent of a free flight between the US and Europe. Take a look at the three cheapest airlines we have found that fly to Georgetown, notice the difference in price? Book now with Copa Air and you can save as much as $225 compared to the next best offer! This entry was posted on Friday, April 18th, 2014 at 12:56 am and is filed under Airfare Deals. You can follow any responses to this entry through the RSS 2.0 feed. You can leave a response, or trackback from your own site.